Woodlands Hospice Charitable Trust is an independent registered charity (Registered Charity Number 1048934) which was set up in 1991 in order to raise the funds necessary to build and run Woodlands Hospice. The Trust was set up as a direct response to the needs of local people living with cancer. The experiences of General Practitioners, Macmillan nurses and hospital staff identified the need for a facility for the care and support of those with life-threatening illnesses in North Liverpool. The Community Therapy Outreach Service was established in 2001 with a grant from the New Opportunities Fund. The team currently consists of an Occupational Therapist, Physiotherapist and three Complementary Therapists and these services are provided in the patient’s own home. In 2005, following further fundraising, an Outpatient Annex was opened, allowing the Hospice to offer Outpatient Services including medical review, physiotherapy, anxiety management, reflexology and counselling on an appointment basis. In 2006, we launched a Capital Appeal to raise the £2.37 million needed to build an Inpatient unit as an extension to our existing building. 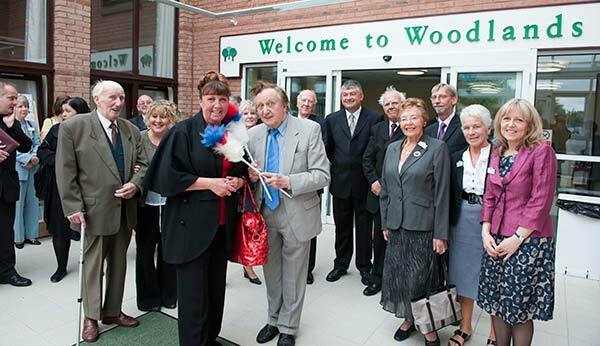 The people of Merseyside responded, donations, grants and equipment flooded into the Capital Appeal office and on June 6th 2009, the 15-bedded extension was opened and Woodlands' Inpatient unit began accepting its first patients. In January 2012, we launched a small Hospice at Home service for patients with a South Sefton GP. We were fortunate to receive a £498,000 grant in 2013 from The Department of Health to make alterations to the old Day Therapy building to create a suite of new therapy rooms, a rehabilitation/­gym facility and a modern art room. In addition we converted the lounge area into a new café/hub to improve facilities for patients and visitors, and enable good access to the mature garden area. The new facilities opened in April 2014. 15 bedded In-Patient unit as an extension to our existing building. The Inpatient Unit was officially opened by Ken Dodd.